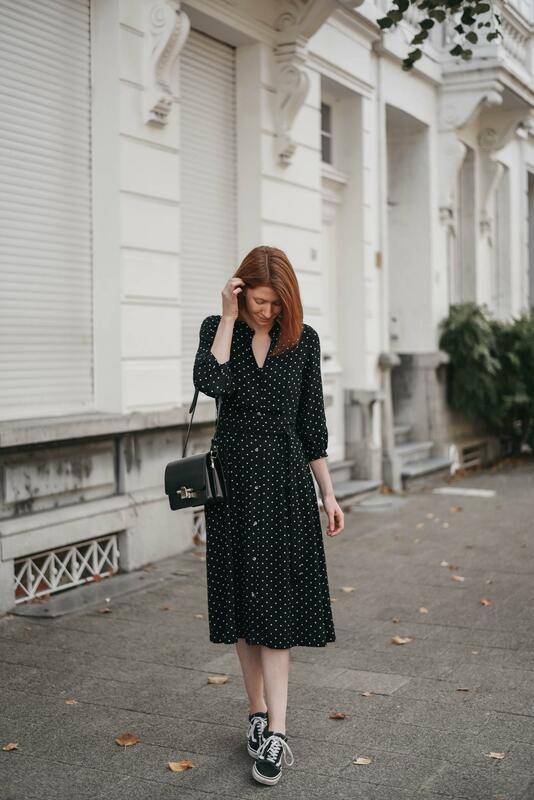 … polka dot it! Ah, Miley Cyrus songs are my favorites to reference to in blog post. Hers and Justin Biebers. If you doubt my level of adulthood now, you’re right to do so. On to what I really want to write today! 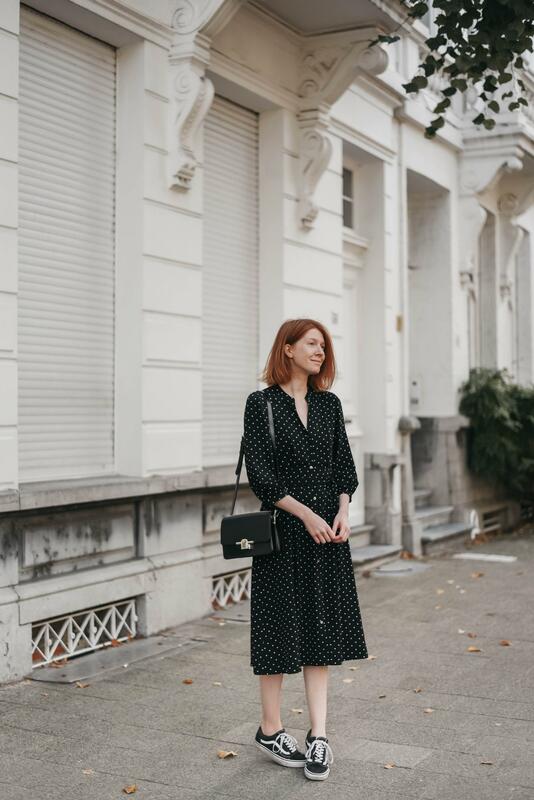 There was no trend I loved as much as the polka dot trend this past summer. I’m always a bit hesitant to jump on a new trend and usually like to dip my toes in first. But this time things were different. If a piece of clothing had dots, I wanted it. 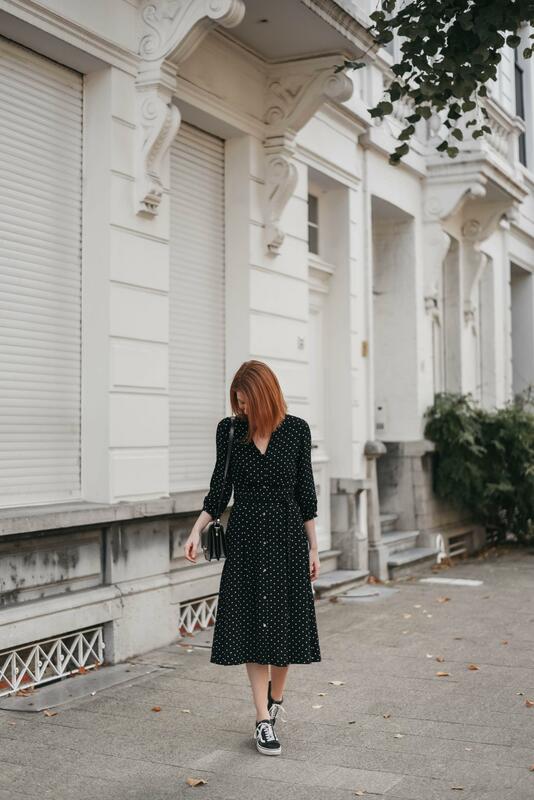 It started with polka dot silk scarves, but I soon moved up to from-top-to-bottom dotty outfits and this Whistles dress was my match made in heaven! I spotted it first on Joanne from The Stylist And The Wardrobe and fell head over dots in love. The dress was from an old collection, so it took quite some online digging before I finally found the last one in stock. In my size. It’s ridiculous how happy these strokes of luck make me! 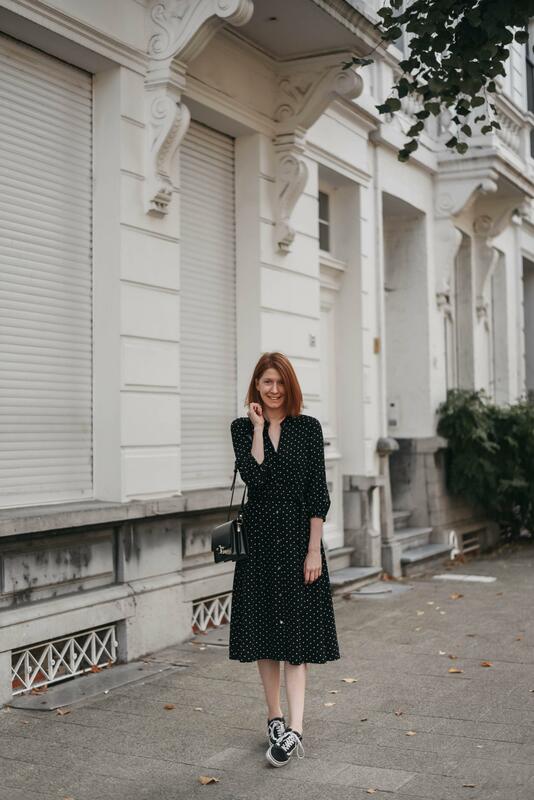 Joanne styled her dress with white boots, but I love my midi-dresses paired with sneakers such as these Vans or my Veja sneakers. 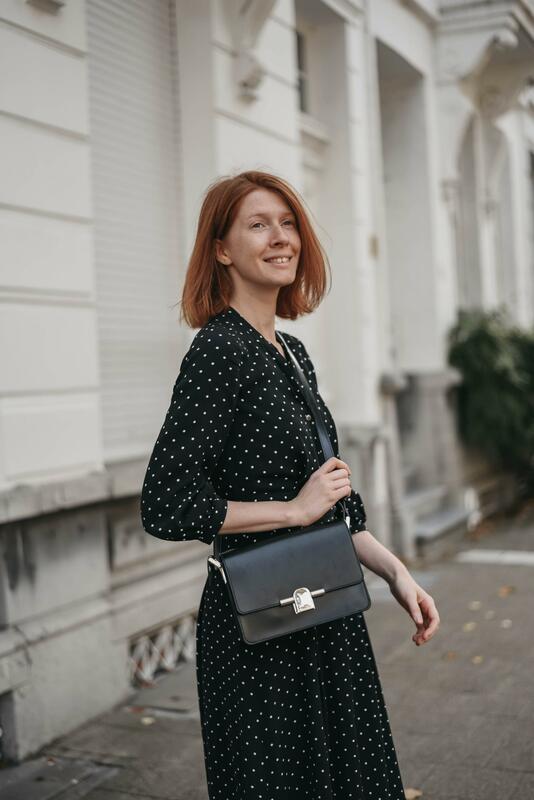 I’ve had the dress since July, but have kept it aside for a while because I thought it was a bit dark for Summer and would look its best in the Fall. I’ll admit: it was hard not to wear it because I love it SO much! You can now guess ONE time what item of clothing I’ve worn the most throughout September, haha. These photos were made on a warm Fall day. I didn’t need tights, a scarf or a jacket. 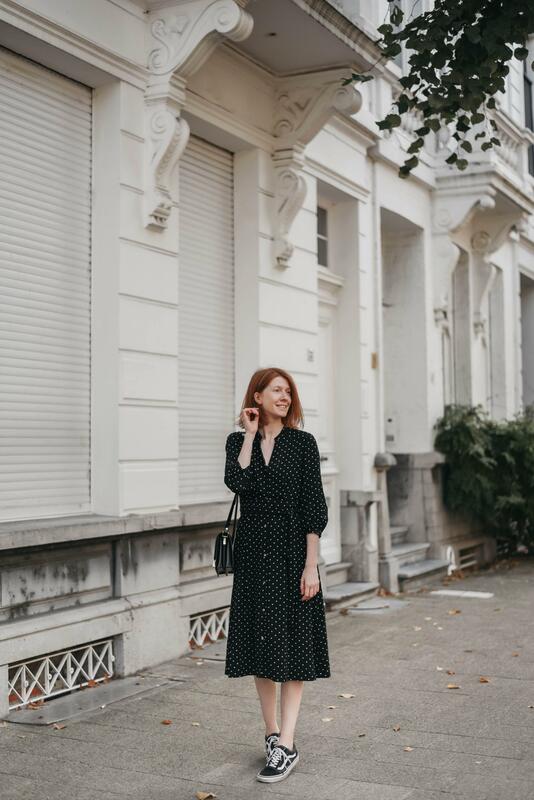 When the temperatures start to cool down I plan on wearing my dress with Chelsea boots, a leather moto jacket and XL wool scarf, so I can wear it well into winter! I love this paired with sneakers! I haven’t been bold enough to do that myself (not that I wear dresses very often, come to think of it) but I think I have a couple of things I could try it with.